"Please note that I am very happy with your service and feel it is a valuable resource in this volatile market." - Jerry D.
Welcome to all of the new CDx3 Newsletter subscribers who signed up during September. This is your first issue of the CDx3 Newsletter, a free monthly newsletter devoted to the interests of CDx3 Preferred Stock investors. And thanks to all of you who took me up on my free offer from last month - a free copy of Preferred Stock Investing to those who subscribed to the CDx3 Notification Service during September. The offer has expired but we will definitely be running this promotion some time in the future, so be sure to keep an eye on the CDx3 Newsletter each month. This report was just published a few days ago. Please download and read your free copy (PDF, download now). You'll be very glad you did. I spent several years researching and developing the criteria that ordinary preferred stocks have to meet in order to be considered the highest quality - "CDx3 Preferred Stocks." So far, during this 14-month long global credit crisis of historic proportions, the CDx3 Selection Criteria not only have a perfect record, filtering out every failed bank in advance, but have left CDx3 Investors with 100% of their dividends paid on time and in full every month. 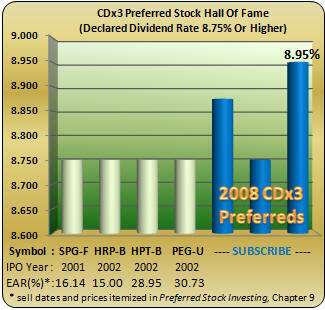 The Last Month's CDx3 Investor Results article shows you the history of the highest dividend paying CDx3 Preferred Stocks - the CDx3 Hall Of Fame - including the highest payer ever, which was just issued during September 2008. While Preferred Stock Investing provides you with the information and resources that you need to implement the CDx3 Income Engine entirely on your own, let's face it - many are going to want someone else to do the work and just email them when a buying or selling opportunity comes up. That's what the CDx3 Notification Service is for. And now, in addition to the individual subscription, we are offering group subscriptions to the CDx3 Notification Service. The Special Announcement article explains the new group subscription, how it works, pricing and provides a link to more information. The group subscription is perfect for brokers, financial planners, investment groups, families and friends as well as for existing CDx3 Notification Service subscribers. The CDx3 Company Spotlight shines on Virginia-based Dominion Resources. Dominion's history dates back to 1787 and the company has a preferred stock that has been continuously trading since 1944. Dominion, now a $23 billion utility is also an issuer of CDx3 Preferred Stock. Doesn't it just fry your bacon when you type the trading symbol of a preferred stock into an online quote web site and get that annoying "invalid trading symbol" message? That's because the trading symbols of preferred stocks are not standardized (how this helps investors is not clear to me). This month's CDx3 Question Of The Month article clears up this ridiculous confusion by providing you with the naming conventions used by common quoting web sites and brokers. The legislature just passed the don't-call-it-a-bailout legislation that is intended to slide a trampoline under free-falling financial institutions. While it will be several months before the provisions of this legislation are implemented (i.e. the "toxic debt" is removed from bank's books, freeing them up to start lending again), we should start to see some affects in the coming weeks. I look forward to reporting back to you in next month's issue of the CDx3 Newsletter. The CDx3 Selection Criteria have successfully filtered out every financial institution that has failed during this credit crisis. CDx3 Investors knew to stay away from Washington Mutual, IndyMac, Freddie Mac, Fannie Mae, Bear Stearns, New Century and Lehman Brothers from the beginning. September 2008 left many investors wondering where the bottom of this 14-month long credit crisis is; but those who invest in CDx3 Preferred Stocks* haven’t missed a beat. The financial institutions that have failed were all filtered out by the ten CDx3 Selection Criteria (Preferred Stock Investing, Chapter 1). Might there be exceptions down the road, especially during this historic credit crisis? Sure. But, to date, there has not been. No Dividends Missed: CDx3 Preferred Stocks have not so much as missed a single dividend payment – ever. And we’re talking about decades-long track records of quarterly dividend payments in most cases (see this month’s CDx3 Company Spotlight article below). Washington Mutual, IndyMac, Freddie, Fannie, Bear Stearns, New Century, Lehman Brothers and the other smaller banks that have failed this year, not one of them qualify as an issuer of CDx3 Preferred Stock - never did. For all of the market gyrations throughout September 2008, CDx3 Investors have continued to come out on top – month after month, quarter after quarter - cashing a steady stream of dividend checks. How Is That Possible? On September 30, 2008 I published a summary of the CDx3 Income Engine titled “Quick Guide To Preferred Stock Investing During A Global Credit Crisis” and I'm making it available to you for free. The Quick Guide, complete with real examples, is non-promotional and a very important read for those interested in preferred stock investing. 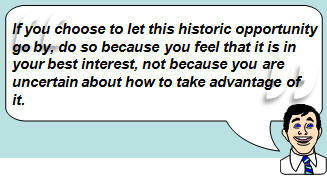 The opportunity in front of preferred stock investors is huge. If you choose to let this historic opportunity go by, do so because you feel that it is in your best interest, not because you are uncertain about how to take advantage of it. September 2008 was important to CDx3 Investors for another reason. What issuer of CDx3 Preferred Stock was founded in 1872, is a $22 billion bank with assets over $135 billion and avoided sub-prime lending, option adjustable-rate mortgages and complex debt securities and has seen its stock rise over 35% ($29.55 to $40.45, Sep 26, 2008) this year? Answer: The same bank that, during September, issued the highest dividend paying CDx3 Preferred Stock in history – 8.95%. It is also the same bank whose old-school CEO just fired off a scathing letter to Congress calling the policy-makers at the U.S. Treasury unqualified former Wall Street types who know nothing about commercial banking. Three of the seven preferred stocks that have made the CDx3 Hall of Fame were issued this year, including the record-setting September issue. Subscribers to the CDx3 Notification Service received a CDx3 Buyer's Notification email message on September 8 identifying this record-setting CDx3 Preferred Stock. Great EARs! Check out the Effective Annual Return (EAR) earned by the previous four, all over 15% to the CDx3 Investors who purchased them (for about $25) when they were issued (all have now been called except HPT-B from Hospitality Properties). CDx3 Investors are able to earn such high returns by following the preferred stock investment method described throughout Preferred Stock Investing. By knowing when, how and why to screen, buy and sell the highest quality preferred stocks, CDx3 Investors have multiple opportunities to add a nice capital gain on top of the above-average dividend income paid to them by CDx3 Preferred Stocks (see Quick Guide). Trading Symbols: Want to know the trading symbols of the 2008 CDx3 Hall of Famers? Subscribers to the CDx3 Notification Service receive a CDx3 Buyer’s Notification email message whenever a new CDx3 Preferred Stock is issued. Subscribers are among the first in the world to know about these spectacular preferred stocks. The CDx3 Buyer’s Notification email message includes a CDx3 Preferred Stock Spec Sheet (see sample) with all of the particulars for each new CDx3 Preferred Stock issue. The annual dividend rate paid by new CDx3 Preferred Stocks has been increasing since June 2007 (now at an average of 8.8%). Will the next CDx3 Preferred Stock break the 9% barrier? Subscriptions to the CDx3 Notification Service are now available for groups. While an individual subscription costs $180, subscriptions for groups are now available for as little as $60 per member (more info). When I speak to groups about the CDx3 Income Engine they ask how much a subscription to the CDx3 Notification Service costs. When I say "$180" they always ask "...but what about for all of us?" They have a point. For members of groups, $180 per person can add up pretty quickly. So this month we are announcing the group subscription to the CDx3 Notification Service. When your group subscribes to the CDx3 Notification Service, you are allowed to copy (hardcopy or electronically) CDx3 Notification Service materials for the members of your group. Here's how it works: Since groups come in all different sizes, large and small, we sell group subscriptions in "4-Member Packs." Each 4-Member Pack covers up to four members of your group and only costs $240. Just get the number of 4-Member Packs needed to cover the members of your group and you're all set (more info). It does not matter who your members are either; the 4-Member Pack covers any four members. We do not need (or want) to know the names of your members. So members can come and go. Easy! By using the new group subscription, up to four people can subscribe to the CDx3 Notification Service for as little as $60 per person. Compared to $180 per person, the CDx3 Notification Service group subscription is a whale of a deal! Group subscriptions are great if you are a broker or financial planner. Are you a member of an investment group? Learn something new! Or get together with another family member or friend; it just takes two to be a group! Current subscribers can save a few bucks this way too. Get a few friends to buy a 4-Member Pack and share the cost! Family membership: If there is even one other person in your family interested in investing, you're a group! Rather than buying two individual subscriptions for $180 each, buy a 4-Member Pack for $240 - that takes you down to $120 per person, a $60 per person savings. Do something new and different and do it together! 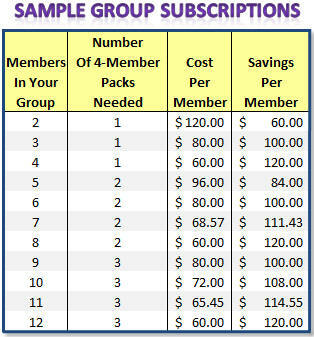 Find the number of members in your group on this sample table - see the savings per member? When you subscribe to the CDx3 Notification Service as a group, the savings per member is pretty hard to beat - just like CDx3 Preferred Stocks! (more info). Since banks have been dominating the headlines lately, the CDx3 Company Spotlight, for the last several months, has been shining on the many non-bank companies that issue CDx3 Preferred Stocks. Southwest Gas Corporation (utility), BRE Properties (apartments), W.R. Berkley Corporation (insurance), Hawaiian Electric Industries (utility) and Simon Property Group (shopping malls) have all been featured in the CDx3 Newsletter over the last few months. Spotlighting these non-bank issuers of CDx3 Preferred Stocks should remind you of the importance of diversifying your investments, especially as the economic pendulum swings. Because they have the ability to raise their revenue as costs rise, and because they are frequently a "sole-provider" within the market they serve, utilities are often seen favorably as an investment choice. It is for this reason that I wanted you to meet Dominion Resources (NYSE: D). One of the things that makes this utility interesting is that one of Dominion's preferred stocks has been trading day in and day out and continuously paying its dividends since August 29, 1944 (VEL-E, not a CDx3 Preferred Stock). 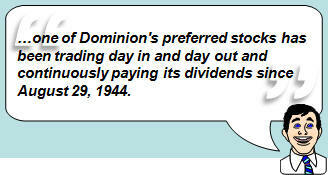 Another interesting thing about Dominion is that it is one of America's oldest publicly traded companies. Dominion has been trading since back in the days when no one thought that there would ever be more than twenty-six publicly traded corporations; Dominion trades on the New York Stock Exchange under the single-letter trading symbol D.
Dominion, a $23 billion Virginia-based utility with its history extending back to 1787, has grown by mergers and acquisitions of smaller utilities. Dominion now owns 7,800 miles of natural gas transmission pipelines along with the nation's largest natural gas storage system (950 billion cubic feet of capacity). Dominion currently serves customers throughout eleven states and is an issuer of CDx3 Preferred Stock. Typing a preferred stock symbol into a service like MarketWatch often comes up empty; what's the problem? - Bob C.
If you believe that the brokerage industry has conspired to keep individual investors in the dark about preferred stocks, the problem that Bob has been having could be Exhibit A. Just like common stocks, in order to buy, sell or just get a quote from your broker or an online quote service (such as MarketWatch.com), you need to know the trading symbol of the preferred stock that you are interested in. Unfortunately, preferred stock trading symbols are not standardized like the trading symbols for common stocks. The common stock symbol ‘IBM,’ for example, gets you a quote for International Business Machines on any service. But preferred stock symbols vary depending on the service that you are using. The Hyphen Convention: Probably the most common symbol convention for preferred stocks is the hyphen convention where a hyphen follows the trading symbol of the issuing company, then a letter indicating the specific preferred stock series (-A, -B, -C etc.). For example, Public Storage, the company that provides self-storage units for rent all over the country, has a trading symbol of PSA. On many services then, their series L preferred stock has a trading symbol of PSA-L. But each service is allowed to substitute their own preferred stock symbol convention so, unless you are in the know, the inevitable confusion can result. Page 16 of Preferred Stock Investing provides the only cross-reference that I know of for preferred stock trading symbols by online service. The PR Convention: BigCharts.com is owned by MarketWatch (which use to be owned by CBS). BigCharts and MarketWatch both use the PR convention, where the letters “PR” are substituted for the hyphen. PSA-L, for example, is PSAPRL on BigCharts and MarketWatch (try it). The -P Convention: Yahoo Finance, a great resource for stock market information and news (finance.yahoo.com), uses the –P convention. PSA-L would be PSA-PL at Yahoo Finance (try it). Check out page 16 of Preferred Stock Investing for a variety of preferred stock trading symbol conventions. One of them should work with your service. Thanks to Bob C. for the great question. You will receive a free copy of the CDx3 Special Report "Dividend Accounting." The 14-month long credit crisis has shaken our financial system and everyone who is invested in it (which is just about everyone). Even though the CDx3 Selection Criteria, day after day, have successfully filtered out every failed bank for over a year now, and even though there has not been so much as a missed dividend for those who have invested in CDx3 Preferred Stocks, there's still some anxiety. Enjoy reading the Quick Guide and thanks again for your interest in my research. Will Banks Bounce Or Bust Right Through? September 2008 will be viewed as one of the most important months in global financial history, and not one that anyone cares to repeat. The roller coaster became almost unbearable with the Dow Jones Industrial Average having its worst day in history and one of its best days in history back-to-back. Bring your own Dramamine! A few days afterword, just to calm everyone down, the legislature found a way to turn an 8-page bailout proposal into 464 pages of me-too pork spending. "We'll pass it before the weekend's out...no we won't...yes we will...which weekend?..." For better or worse, they passed something that vaguely resembles the original intensions. You see, banks have so much "toxic debt" (loans linked to mortgages issued to people who are not, and never were, going to be paying them back) that the banks are scared to make any more loans. What if even the tiniest fraction of the new loans go bad too? The result: a subzero freeze on credit that 14 months of blowtorching has been unable to thaw. Credit (new loans) has simply become unavailable - no new factories, no new mortgages, no new credit cards, no consumer spending on credit cards, no new jobs, no economic growth - just Dramamine. The idea behind this don't-call-it-a-bailout legislation is that if the government takes the toxic debt off of the bank's hands, the banks will be able to start lending again. Consumers will consume, developers will develop and employers will employ and the U.S. economy, which is the size of the next seven largest economies in the world combined, will start to move forward again. For better or worse, right or wrong, that's the idea.